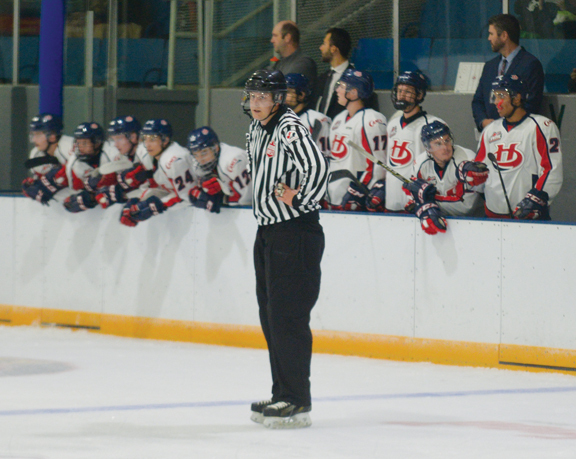 With the Lethbridge Hurricanes and Medicine Hat Tigers in town over the weekend for a preseason matchup, a local official had the chance to suit up to work the lines. Taberite Jared Capner, a hockey official of six years, had the chance to don the stripes during the preseason game which helped kick off the hockey season. The road was a long one for Capner to get into a Western Hockey League game but he says it was well worth the effort to finally get the call. While most don’t shift to officiating after their minor hockey careers, Capner adjusted his focus to wearing the stripes after speaking with a local referee who advised him he had the right stature to move quickly up the ranks. “He told me that me being the size that I am is a big thing for higher level officiating and they love seeing bigger guys in games just because it is sometimes easier to break up fights,” continued Capner. Being from Taber also made the game special as he had a chance to not only work the lines in his first WHL game but it was in his home arena. “The game was something I can’t even describe. It was amazing to be doing that game in my hometown. It was fast and fun and the crew I was working with, as well as the supervisors in attendance, were unbelievable. They made the game that much better. It was a good game to have a supervisor at strictly because we had a little bit of everything in it. We had some scrums, we had some tight calls that needed to be made and we had some stuff you don’t see very often,” said Capner. While well-versed in hockey officiating, the speed of the game is ratcheted up quite a few notches at the WHL level. He was also incredibly excited by the support he received from the community not just in the hockey realm but the entire town of Taber. With the minor hockey season inching closer every day, his focus is starting to shift to getting back into the regular season grind. The experience he gained by getting on the ice for a WHL game though will go a long way with Capner who is hoping to continue to reach higher levels of hockey officiating.